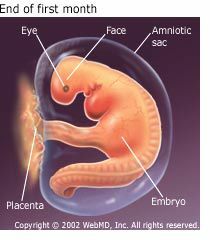 The amniotic sac is a water-tight sac that forms around the fertilized egg. It helps cushion the growing embryo throughout pregnancy. 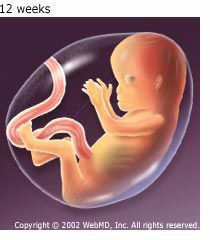 The placenta also develops at this point in the first trimester. The placenta is a round, flat organ that transfers nutrients from the mother to the baby, and transfers waste from the baby. By the end of the first month of pregnancy, your baby is around 6-7mm (1/4 inch) long - about the size of a grain of rice! Your baby's facial features continue to develop. Each ear begins as a little fold of skin at the side of the head. Tiny buds that eventually grow into arms and legs are forming. Fingers, toes, and eyes are also forming in the second month of pregnancy. The neural tube (brain, spinal cord, and other neural tissue of the central nervous system) is well formed. The digestive tract and sensory organs begin to develop. Bone starts to replace cartilage. The embryo begins to move, although the mother cannot yet feel it. By the end of the second month, your baby, now a fetus, is about 2.54cm (1 inch) long, weighs about 9.45g (1/3 ounce), and a third of baby is now made up of its head. By the end of the third month of pregnancy, your baby is fully formed. Your baby has arms, hands, fingers, feet, and toes and can open and close its fists and mouth. Fingernails and toenails are beginning to develop and the external ears are formed. The beginnings of teeth are forming. Your baby's reproductive organs also develop, but the baby's gender is difficult to distinguish on ultrasound. The circulatory and urinary systems are working and the liver produces bile. At the end of the third month, your baby is about 7.6 -10 cm (3-4 inches) long and weighs about 28g (1 ounce). Since your baby's most critical development has taken place, your chance of miscarriage drops considerably after three months into the pregnancy. SOURCE: Mayo Clinic: "Fetal development: What happens during the first trimester?" 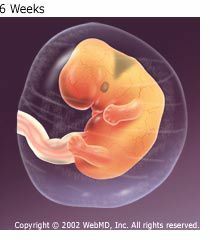 Mayo Clinic:"Fetal development: What happens during the second trimester?" Mayo Clinic: "Fetal development: What happens during the third trimester?"